8It’s almost time for one of the biggest events of the year – Halloween! The excitement is already starting to build, as children and adults alike prepare for the spooky, yet awesome holiday. If this is your toddler’s first Halloween, you’re no doubt excited to see them all dressed up and really joining in this year. From pumpkin carving to trick or treating, there’s plenty you and your little one can do to mark this annual holiday. 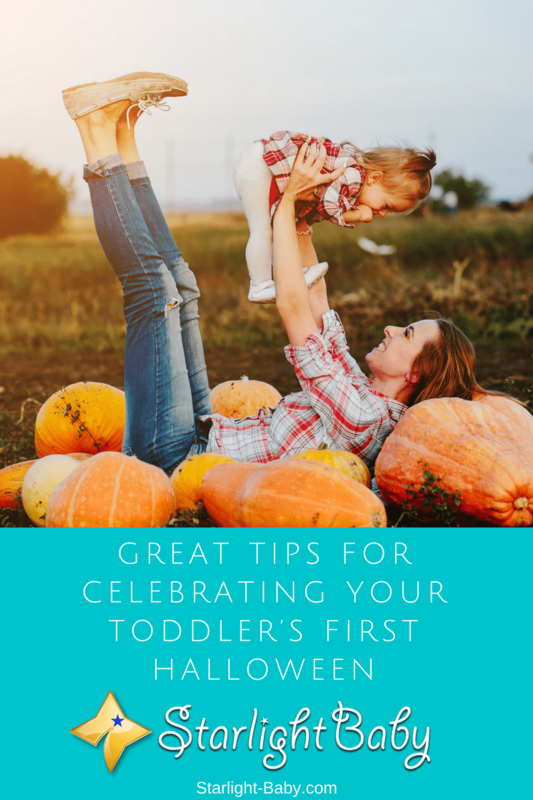 However, before you get too carried away with all of the things you and your toddler can do for their first Halloween, there’s a few things you should really keep in mind. Remember, Halloween may be a fun time for you, but for a toddler it has the potential to be a little too spooky! So, if you want to make sure your little one has a memorable and enjoyable first Halloween without becoming overwhelmed, below you’ll discover some great tips you’ll want to follow. Of course, some amount of planning will be needed to ensure your toddler has a memorable first Halloween. However, it’s definitely best to expect the unexpected! Many parents have this image of what they think their little one’s first Halloween will be like. They envisage a picture-perfect setting where everything runs smoothly and the day is packed full of fun and laughter. They don’t take into account their toddler having an epic tantrum because they really don’t want to dress up as an adorable pumpkin! Or the fact it could prove too scary on the actual day. It’s natural to have expectations of your toddler’s first Halloween. However, it’s also important to remember that things might not go to plan and that’s totally OK.
Dressing up is no doubt one of the best things about Halloween and toddler’s LOVE dressing up, so surely, it’s a win-win situation? Sadly, there’s a lot that can go wrong with your little one’s Halloween outfit. Therefore, it’s a good idea to think carefully before you make a decision. You’ll want to look out for an outfit that’s not going to be itchy or uncomfortable for your toddler to wear. A lot of Halloween costumes may look adorable, but they aren’t exactly practical or comfortable. If your toddler isn’t comfortable, you can be sure they’re going to let you know about it! You’ll also want to avoid costumes which come with headpieces and uncomfortable shoes. Toddlers aren’t a massive fan of wearing anything on the head for too long so no matter how cute an outfit looks, if it’s got a headpiece, opt for something else instead. Shop for comfortable toddler costumes on Amazon.com! If you’re heading out trick or treating, you’re not going to be able to control the spooky surprises you and your toddler might be presented with throughout the evening. However, what you can do is make sure your little one is prepared for the surprises they might face. Before leaving the house, be sure to sit down with your toddler and explain the types of things that are likely to happen. Explain people may pop out and say “boo” or make scary noises. There may be doorbells which start to play spooky music. You’ll also want to prepare them for seeing people wearing scary masks, dressing up like clowns etc. All of these things can be really scary for a toddler, but at least by explaining what can happen and reassuring them it’s not real, you’ll limit the risk of them getting too freaked out. Also avoid teasing your toddler if they are feeling nervous or scared or telling them they need to face their fears. After all, Halloween is supposed to be fun and your toddler isn’t going to find it fun if they’re being forced into something they don’t want to do. Another good tip if you’re heading out trick or treating, is to leave early. Ideally, you want as little disruption as possible to your toddler’s routine. So, heading out early gives them plenty of time to come back, enjoy a few pieces of candy and then get ready for bed. There’s another advantage of getting trick or treating out of the way early, and that’s the fact it will be a lot less scary for your little one. If you can arrange to go in the morning, perhaps with other local children and their parents, the light will be reassuring and there also won’t be many people dressed up in scary masks. In fact, trick or treating in the morning could be the best option anyway, as it also ensures your toddler won’t experience a sugar rush close to bedtime. They can enjoy some of their candy at lunch time and the effects will have worn off by the time it comes to put them to bed. Candy is one of the main benefits of Halloween and it’s what kids tend to get the most excited about. However, even though it’s a one-off treat, it’s important to keep candy limited. While it’s unlikely the candy will cause issues for the teeth in just one day, it will lead to hyperactivity. Toddlers are already hyperactive so the last thing you need is for them to experience a sugar rush too; especially if it’s right before bedtime! So, make a rule about how much candy your little one can have this Halloween and remember to make sure they eat it as early as possible to prevent bedtime struggles. Trick or treating isn’t for everyone so why not look into alternative Halloween activities? All toddlers are different and some may find trick or treating a little too overwhelming. The good news is, there’s plenty of alternative options and you can still get dressed up. Why not take your toddler to a local harvest festival or simply host your own Halloween party? Celebrating with friends and family can be a much more memorable and enjoyable experience than trick or treating anyway; especially for your toddler’s first Halloween. We have a list of 10 great Halloween activities for toddlers here, which you may want to check out! If you are heading out, remember your toddler is likely going to need bathroom breaks. If you’re still potty training, be sure to take the potty with you. You’ll also want to make sure the costume isn’t too difficult to remove just in case. Make sure your toddler goes to the toilet before heading out, then try to make the outing as short as possible to prevent any accidents. OK, so it’s rare a toddler is ever on their best behavior, but on Halloween you’re going to need to cut them a little more slack. They’re going to be excited, the atmosphere is going to keep them hyper for longer. They’re likely going to throw more tantrums as they start to get more tired and frustrated. It’s just one night so don’t expect too much and forgive them if they get a little overexcited. So, there you have it – 8 tips to ensure your toddler’s first Halloween goes as well as expected. Whilst you can never fully prepare for how the day will go, the tips above will help to increase the chances of both you and your little one enjoying the experience as much as possible. I’m already planning on how I can dress my little cousin for the Halloween celebration. I’ve ordered for the costume from a foreign site that sells Halloween costumes and we’re getting ready for the celebration! I I’m grateful for the insightful article on how to make it a great experience for everyone. Wow! That sounds really exciting. And it’s really thoughtful of you to have bought a custome for your niece. I’m sure she will be delighted and excited to celebrate Halloween. Now you can make use of the tips provided here for a fun-filled and child-friendly celebration. I had to come across your reply now and wish to share the experience we had then. It’s disheartening when I got my money back and no Halloween costumes delivered on grounds that they can’t cover the free delivery cost they promised then. We had to just have fun at home and enjoyed the celebration then which was not the initial plan. This are nice brilliant ideas. It’s time of the year to celebrate Halloween. Season of displaying and dressed of spooky outfits. For first Halloween of toodlers, it is important how do they respond to the things around them especially the Halloween decorations. Know their curiosity and make those curiosity as basis if you think they will be excited or feel spooky. These are 8 great tips for those toodlers to celebrate their first Halloween. Thank you for this suggestion, sweetpot81. You’re right. Parents should check their children’s reaction to Halloween decorations/customes first before putting them up. Kids could get scared and cry, and give them a fearful impression of Halloween instead of a happy one. Their fearful reactions may be funny to us adults but it could leave a negative impact on them. All this talk about Halloween just makes me sad, not because I don’t like the celebration but because we don’t get to celebrate and experience the awesomeness of the event here. Anyways, I think Halloween is a great time to spend and have fun with love ones, plus your tips just makes it even more fun for parents and kids. I hope I can someday get to share the Halloween experience in the way of your post. Oh, that is sad indeed, Rumu. Do you have a particular celebration similar to Halloween? Some of the tips here are applicable to other celebrations or events as well so I’m sure you’ll find one or two of these tips useful, like tip #1, #2 and #8. Ah, I absolutely love the Halloween time. This won’t be my toddlers first one since he’s older than one year already but still. A great and very informative article. I have to agree with your point about candy and that the parents shouldn’t allow their kids too much of it or they will be up all night – trust me. Also, remember that Halloween is supposed to be a fun time so focus on that and don’t overstress. Just make sure that the costume that they’re wearing is comfortable and that they like it. Oh yes, we should be mindful of the candies they collect. It’s too much for one child, and bad for the teeth, too. The last time my two younger kids went trick or treating, I had them share their candies with their older brothers so they don’t eat everything, haha. Eversince they experienced trick or treat, they have anticipated Halloween and are counting the days till it’s Halloween again. I guess it’s one of a child’s best days aside from Christmas. They also get to wear different customes every year. In South Africa we don’t actually go out and trick or treat due tithe crime rate but what we do is go to a mall and they usually have things for the children. This will be my little girl first Halloween and I can’t wait to see her face when she sees all the people dressed up. She loves staring at people lol. Yes, malls are usually the go-to place for trick or treats because most establishments there have treats for kids who go around dressed in lovely customes. Kids so love it! My two young girls can’t also seem to wait for Halloween to come, haha. Yes. All first of the baby should be photographed and video recorded. I don’t have many of these when I’m small so these kids should get those. Because all of this things are priceless treasures over time. I am really thankful for the technology we have now. Doing the things you mentioned are so easy now, unlike before where one needs to buy a camera or camcorder to record life events. Now, all we need is a smartphone/mobile phone and we can take our kids’ precious moments in seconds. Kids these days will surely have a lot of fun in their later years when they look back at their shots now, haha. Oh! Wow. That sounds like a lot of fun. Well, you still have a few days to look for a really awesome outfit for her. Good luck with the both of you! Enjoy every moment of it. As a mother of a very cute little girl, I want to have my kid a best memorable experienced in every activities in her school. I think all mother’s like that too, but sometimes there’s a situation that you need to consider, that I dont want my daughter to be spoiled. This article is very important for any parent or guardian who is getting ready for their little one first Halloween party celebration participation. It gives insight on what to do in order to have a good experience than a horrible one. I love the tip on “Prepare Your Toddler For Any Nasty Surprises”, this is so true because most times, Halloween is accompanied by scary costume and outfit, so if you are not prepared for such encounter, it might not be a good turn out for the toddler.